The Belmont Flat is absolutely perfect. It's a stone's throw from The Local, Mas, and several other great Belmont restaurants. It's an easy walk or jog to the University; but you are far enough from those things that you don't hear a peep at night. It was a great getaway for my wife and me. Customer service was beyond top-notch. Great conversations with the team leading up to and through my booking. Beautiful view and location. The house was eccentric which both added to the fun and made for a few difficulties but nothing that really impacted our stay... the space was large and clean, and the surrounding area was amazing. We were in town for a family reunion. We did have the opportunity to walk into town and found the walk easy and safe. The house is clean and comfortably decorated. The beds were comfortable and the bathrooms were nice. The neighborhood was quiet. The parking spot behind the house is helpful. great email communication. I felt very prepared when arriving. I think the only thing that may help is some better explanations of where exactly it is located. Great location,amenities, cleanliness, and experience. I was thoroughly impressed as soon as I walked in, and thought that it was much better than some of the more expensive hotels that I have stayed in, in the past. Even comparing this room to the Omni, I think I got the better experience. Thank you! If/when I come back in town I will be staying here again! Great service..I have no complaints whatsoever. Beautiful property at my favorite winery..can't beat that. It was great for graduation weekend because we were able to stay away from the cville crowds, enjoy great wine, beautiful views, and peace and quiet.i would definitely stay here again! Apparently this home was a new listing so we were little worried with no reviews choosing it but couldn't have been better for us. We were there to help our daughter move and property was very close to UVA, very clean, and well decorated. Enjoyed having two living rooms as my doesn't like my addiction to hockey and I like don't their's to Fake Housewives. Thanks for the great place! Fabulous!! The house was gorgeous, beautifully decorated and the kitchen was so well appointed. You will not be disappointed. We really enjoyed our stay. The location was very conveniently in walking distance to the downtown mall. Ample off street parking. We all enjoyed your house. We stayed in your house while we were in town for a family wedding. The house and property are amazingly beautiful and having two bedrooms on the first floor made it very easy to care for our 92 year old mother who was able to make the trip with us. We also really enjoyed the pool! The team was very helpful and friendly and easy to contact for any and all needs. Very pleased with their efforts. The property was terrific for a long weekend reunion. The proximity to the university was ideal. Very relaxing outdoor patio and pool area. Would highly recommend it for reunion events. The only disadvantage is that three bedrooms on the 2nd floor have to share one common bathroom. Only two of the 5 bedrooms have their own bathrooms. The cleaning staff did a great job turning over the room each day and refreshing towels. Much appreciated! This hotel was a perfect fit for our group of friends split between three of the rooms. I loved how close it was to everything and how easy it was to get in and out of the hotel. I will recommend to all my friends staying in charlottesville! The screened in porch was the best! When it rained, it was so relaxing to just sit there and listen to the rain on the trees. The library was awesome and we wish we had more time to just read! This is our 2nd time at Crossfields. It's been the prefect spot for our extended family to gather for Woodberry Forest graduation weekend. About 30 min from campus. Boys brought their fishing rods this time and caught some brim in the pond. 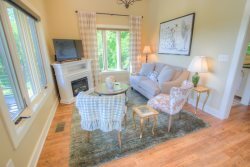 Great spaces to relax together and enjoy our time in Virginia's beautiful countryside. Rental company was helpful, pleasant and knowledgeable. We rented this location for its location. We were able to walk everywhere and ate at the house. Very comfortable and accommodating. We could never get the TV to work properly--very limited channels and the DirectTV remote did not operate as advertised. The shower in the master bath could use a grab handle--my elderly father stayed with us and the lack of a handle was a problem. Other than that we loved the place--fantastic views and access to the mountain top was great. We would stay again. The townhouse was perfect for us. Great location to UVA and our son's apartment. Close to grocery stores. The deck was nice also for relaxing between events. Plenty of parking for 3 cars. Everyone was professional and helpful. Absolutely beautiful home just a few blocks from the downtown mall. We were able to walk to many of our destinations. Lovely antiques, great kitchen and family room. We had an issue with one of the bathrooms and the management company resolved within a few hours. Great stay, I highly recommend this home.